The FLSC series has been discontinued. Please contact our Flow Engineering department for a viable replacement. The FLSC-61 is a 3-wire analog transmitter designed to linearly convert a frequency input to an equivalent voltage output whose level is switch selectable @ 0-5 V/0-10 V. full scale frequency range of 75 Hz-10 kHz is jumper selectable. The span adjustment establishes the frequency point at which the full scale voltage output (5 V or 10 V) is achieved. A sensitivity adjustment permits the FLSC-61 to discriminate between a signal input or noise. The FLSC-62 is a 2-wire loop powered analog transmitter designed to linearly convert a frequency input to an equivalent 4-20 mA current output. A full scale frequency range of 100 Hz -10 kHz is switch selectable. The span adjustment establishes the frequency point at which a 20 mA output is achieved. A sensitivity adjustment permits the FLSC-62 to discriminate between signal input or noise. 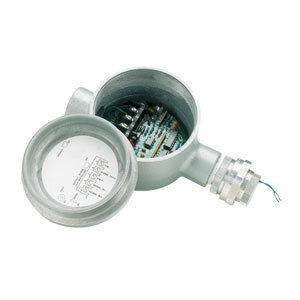 The FLSC-64 amplifies and conditions low-amplitude signals such as those developed by a magnetic pickup coil. The amplitude of the squarewave output equals the input supply voltage of the FLSC-64. A sensitivity adjustment permits the FLSC-64 to discriminate between an input signal and noise.The FLSC-64 contains a built-in test oscillator that enables the operator to verify the amplifier’s operation without a signal source. The power LED illuminates when the input supply voltage is present.